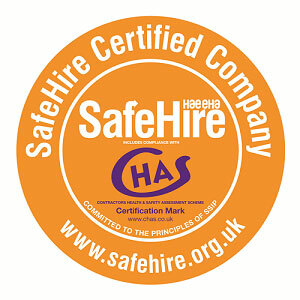 MHM has been awarded the prestigious SafeHire certification quality mark, which is operated by Hire Association Europe (HAE) for the hire and rental industry. Quality Business Risk, Insurance and Financial Control. Document Control and Data Protection. HR and Employment Law compliance. Written commitment to the process at application. Successful desktop assessment of documentary evidence of policies, procedures and management systems by a team of independent assessors. Satisfactory on-site verification checks at Head Office and selected operating branches. interviewing employees of all levels to ensure the company policy is truly “built in”. Sampling key process paperwork for accuracy and effective data management e.g. hire contracts, customer service management systems and training records. Inspecting and testing “ready for hire” equipment from all product categories offered.